AdamMaleBlog - Gay Culture, Art, Music, Humor, and more! 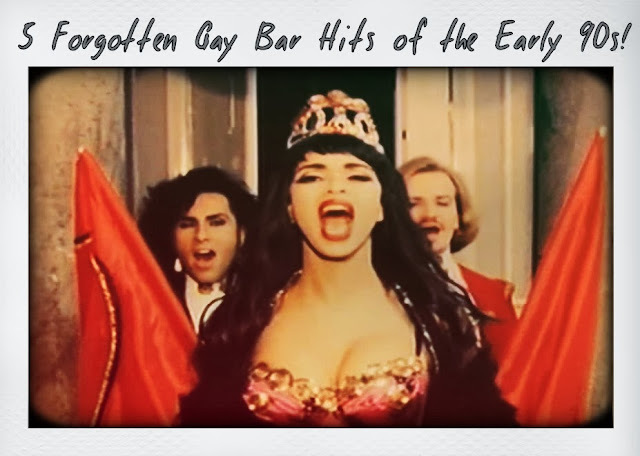 : 5 Forgotten Gay Bar Hits Of The Early 90s! The gay alterna-teen anthem of 1990. Somehow this only made it to #20 in the dance charts. This video quality is off, but it's literally the only version of this video we could find! Check out their bulky hiking outfits! This actually was a #1 hit on the dance charts but quickly forgotten by pop culture. I was driving around in my car with my pal the other day and he had never heard of The KLF, much less country legend Tammy Wynette. I almost pulled over and kicked him out. This made it to #2 on the dance charts! Hard to find a HD video of any of these tracks. If this track doesn't make you want to dance, you are dead inside. "Show Me How to Dance" spent one week at #1 in the dance charts in March of 1991! Listen for the samples from "Dance, Dance, Dance (Yowsah, Yowsah, Yowsah)" by the band Chic and "Dance (Disco Heat)" by Sylvester. Swedish dance music group Army of Lovers "Crucified" only went to #6 in the dance charts, but will always hold a place in the pantheon of gay music history as being perhaps the campiest video ever made. While I am sure everyone over 35 remembers this song, we need to introduce it to the younger generations so it doesn't disappear forever.